CFN – Did the headline peak your curiosity? Mine, too! A few days ago I was handed a clipped advertisement announcing two public presentations on the topic, one in Green Valley yesterday and the other in Cornwall today. So, off we went to the presentation earlier this evening at Ontario Power Generation’s St. Lawrence Development Visitor Centre. Jim Brownell introduced the guest presenter, but not before providing a bit of background. Since his retirement from politics, Brownell has been a tireless worker in the effort to preserve local history as well as in promoting tourism. A member of the Glengarry Historical Society had drawn Brownell’s attention to a series of small, little known monuments strung out in remote locales along Ontario’s border with Quebec. The Society successfully lobbied to have a section of the border re-surveyed and delineated with more visible, durable markers. Wikar Bhatti is one of four Crown Land Surveyors working for the Office of the Surveyor General of Ontario. As he explained, this pre-Confederation boundary was established under the (British) Constitutional Act of 1791, formally known as The Clergy Endowments (Canada) Act. However, not a great deal of resources were put into clearly delineating the boundary aside from marks on maps. In 1860, a provincial land surveyor by the name of Edward Fletcher oversaw a team which surveyed the land, using the best technology of the day. They placed 46 stone markers at various points along the 43 km stretch of the Upper Canada / Lower Canada boundary from Lake St. Francis to the Ottawa River. Markers deteriorate over time, get displaced by farm workers and sometimes moved by pranksters or stolen by collectors. In 1922 the boundary was rehabilitated. Three of the original markers were nowhere to be found and various others were in need of replacement. Two of the original Upper/Lower Canada markers have been donated to nearby museums. 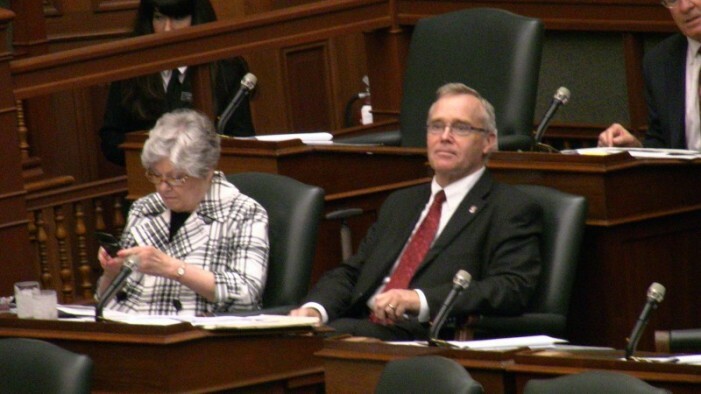 Joint Ontario/Quebec inspections were carried out in 1969 and again in 1987. In large measure, due to the persistence of the Glengarry Historical Society, equal funding from Ontario and Quebec was approved to conduct the work over approximately a five month perod in 2011. Every monument that was not sound or not intact in its original place has been replaced with either a granite marker on a base which is anchored five feet in the ground wrapped in styrofoam or by a steel bar marker that has an aluminum cap. Of course, the markers denote Ontario and Quebec rather than Upper Canada and Lower Canada. The rule of best evidence was applied in placing the new markers. Where the marker could not be found or had been displaced, GPS was used to re-establish the marker in its proper place. Where a marker had been placed in the wrong spot by previous surveyors and was still intact, the location was maintained. In places the markers are meters off the mark, making for rather bumpy “straight” lines. The marker closest to the St. Lawrence River is the one positioned just west of River Beaudette. It only took about 40 years, but the task has been brought to completion. 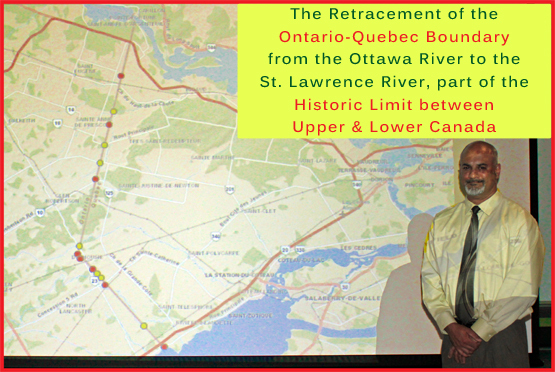 Moving forward, it is hoped that other sections of the Ontario / Quebec boundary can be similarly rehabilitated. The Ottawa River has the least clear section of the border. There is also a desire to see that all sections of the border are maintained on a regular basis. Plans are in the works to create an online digital mapping tool with a border overlay. What’s the potential impact of not knowing the boundary location, you might ask. Not knowing could impact inter-provincial log harvesting in the Ottawa River, responsibility for highways, tile issues and the tax base. Never ceases to amaze me how volunteers get involved, and how many areas and concerns they are involved in without monetary return. History is important for our future, thank you. Eastern Ontario townships like Cambridge, Lochiel and Charlottenburgh are now in the past as well. A fascinating report, Don. At the time of the boundary arrangements, the British made a deal with the landowners to open up settlement from Quebec westward along the St. Lawrence to the Gananoque River at least. A history book I read described the owners as “the Mohawks of St. Regis.” Our neighbors on the river deserve respect for their role in Ontario history. Women of the Clan and Scottish Highlands may not have the easily-traced male y-dna markers, but they played (and play) an equally important role in keeping related groups together over time. Experienced genealogical researchers have often found that the way to discover more about the paternal line is to research the maternal line! Well written! Thanks for the good article. When and how was the border line determined? To me personally it doesn’t follow logical geological boundaries i.e water or a mountain range usually delineate a border but not the Ont/Que. If you ask me Que should end at Ile-perrot. That makes the most logical geological sense.